Today, as I breezed into my office between staff meetings, I was thrilled to see a copy of a new book waiting for me on my desk chair. The fact that the only unoccupied space in my whole office was on my chair, is an indication of what “breezing” in between meetings translates to in terms of any sense of organization ~ but my organizational prowess will have to wait for further exploration in another post! The latest book, which has now be added to the ever-growing list of must reads, “The Innovator’s Mindset” by George Couros is a book that has been quoted and referred to on various social media platforms since its release in October of 2015. 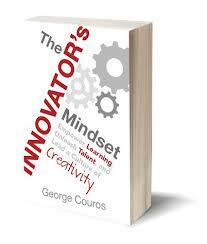 We’ve been asked to read Couros’ book in preparation for an upcoming Principal’s Symposium. Interestingly enough, the publishing company responsible for “The Innovator’s Mindset” is Dave Burgess Consulting. 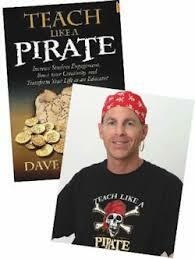 We are thrilled that Dave Burgess is coming to Thames Valley on June 1 to share his “Teach Like a Pirate Message” with our system staff team and invited guests. 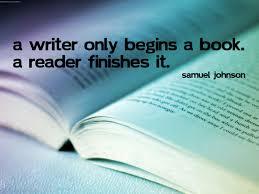 I was very pleased with myself in that I resisted the urge to stop what I was doing and start reading. Instead I reorganized some space on my desk thus leaving room on top of “yet another” pile. But as I was shifting the book, a book mark with the following quote slipped out of the front cover ~ “A writer only begins a book – A reader finishes it”. A Google search identified the author of the quote as Samuel Johnson ~ an English journalist turned poet, editor, novelist, critic and biographer. In rereading the quote, I couldn’t help but reflect on some of the last few posts that I’ve written as a part of this “One a Day in the Month of May” blog series and the subsequent conversations that have ensued either in person or via the comments that readers have posted on the actual site. Let me begin by clarifying that I certainly do not envision myself as a writer and my posts are nowhere near the complexity of a book. But I’ve enjoyed chatting with others who have taken a simple core idea within something that I’ve written and not only related it to their own experiences, but expanded on the central idea and shared their own well -crafted, thought provoking responses and in many cases their words and connections have caused me to stop and rethink my original idea. I continue to be impressed and in awe of my colleagues whose writing is so exceptional. In terms of blog-related conversations, we were embroiled in one day about a post that had been written on the weekend and a colleague from next door popped his head in and wondered why he hadn’t been invited to the party. The conversation was incredibly lively and I’m hoping that it may have spark others to take their incredible reflections and hit the publish button on their own posts. In returning to the quote …. I may have sparked something in my words ~ but it takes the reader’s background knowledge, own personal experiences and reactions to my words to truly complete the circle. Reading should never be a passive activity. We need to ensure that our students understand, appreciate and get multiple opportunities to play their role and to “finish” the work that writers have started for them.